Somebody at Facebook realized that they hit the wall in a major optimization of traditional back-end, which forced them to rethink alternatives. Eventually, as result of that effort React was born. But before that happen, Component Based Development on Front-End came to somebodies mind as a brilliant idea! Then, Evan You decided to introduce a new framework that solves problems which were already (almost) solved. Front-End is not a platform it’s an ecosystem and VueJS treats it as such. A Framework is good as long as it solves common general problems. So one of Vue features, watchers, can be very useful. If you need to execute some code logic, whenever some of your data properties change, watchers are the way to go. Also, Vue implements some very useful event modifiers. Another plus to development with Vue.js is it’s Chrome dev tool. For those of you who already worked in React, it’s obvious how handy React dev tools can be. Vue will not disappoint you since it has Chrome Devtool. extension for debugging. One of the most discussed implementations of Vue, along with components, is the Virtual Dom. It can easily be configured to use LESS or SASS. 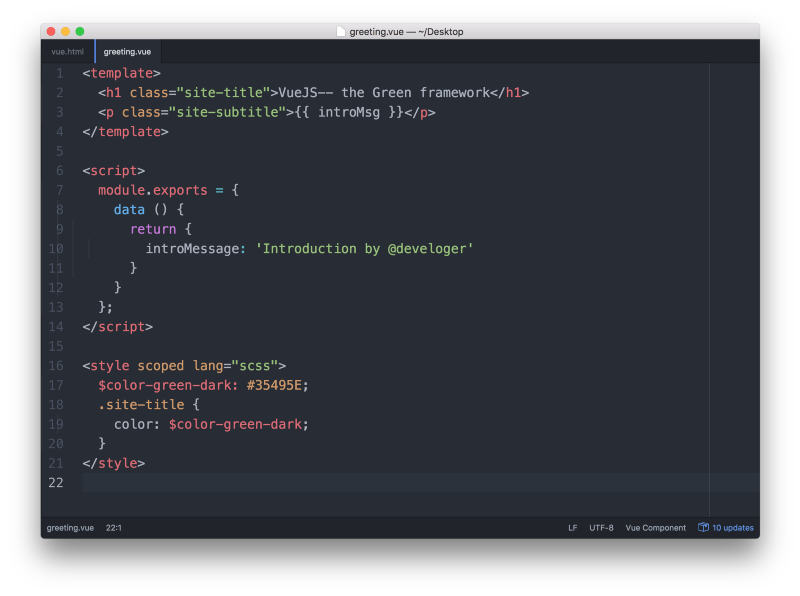 If you prefer JADE more than regular HTML, that will work almost out of the box. Find VueJS — the Green framework, here.